Saiful Malook is one of the most beautiful lakes one can imagine to exist on the surface of this earth. When we talk about this lake, words fail to describe its beauty. Anyone who has been there once can never forget the time that was spent in the company of this enchanting lake. Once we are there we never feel like leaving it; quite opposite to the Trevy Fountain in Rome, the eternal city where the visitors throw coins to wish they would come back soon. Here in the fairyland you don’t need to throw any coin. This is the second part of our series on beautiful, cool, fun and adventure packed spots in the vale of Kaghan. Not very far from Naran, this legendary lake carries a mystic milieu, which is wholesome and refreshing for every soul. A stop over or a full fledged holiday in Saiful Malook can be full of recreation as well as adventure. The biggest plus of this romantic lake; it’s easily accessible from all corners of Pakistan. From Taxila I traveled along the road that took me to Abbotabad. A cool, green and vibrant town Abbotabad is also the divisional headquarter of Hazara and Kohistan districts. It is a two hours drive from the capital Islamabad. Abbotabad is also the gateway to the vale of Kaghan. Here you can have a wholesome lunch or refresh yourself with a cup of tea before driving onward to Mansehra and Balakot. The road from Balakot ascends along the Kunhar through lovely forests and the villages of Paras, Shinu, Jared and Mahandri. The valley is somewhat narrow along this stretch and the views are limited, but as you ascend, the surrounding peaks come to view. One spot that is quite famous for its spectacular view is Shogran. This tiny hamlet surrounded by peaks and forests, is east of the main Kunhar River and hosts the famous Siri-Paye Mountain with a breathtaking view. The next stop of my journey is Khanian. This small town has the best trout you can taste in the north. The dazzling green of Danna Meadows and the slippery glaciers at tarmac, on way to Naran are quite an experience. The way is highly vegetated as the narrow valley is influenced by the annual monsoon season like in rest of the country. I climbed up in elevation and upon entering the valley could see the subtropical pines of the foothills being replaced by forests of the magnificent Himalayan pine. The steep sides of the valley were high and terraced with agricultural crops. Houses and small villages seemed to cling precariously to the steep slopes. The tops of the mountains surrounding the valley seemed to disappear into the clouds. Forests of evergreen trees adorned the steep slopes, where agriculture had yet not invaded. At the mouth of the valley I was at about 3000ft, but I was climbing steadily as I progressed. The Kunhar River flows along the length of the valley about 100 miles. Halfway up the Kaghan village is Naran at an elevation of 8000ft, where I spent my next night. Late in the afternoon, after I had checked into the hotel I wandered though the small village bazaar. The street was unpaved and muddy, with a mountain stream flowing through the center of the town. I went out to the edge of the village and down by the river Kunhar, found a cave in the side of an enormous boulder wall. The cave is tied to the legend woven around the intense love between a fairy and her lover Saiful Malook. Up a picturesque side valley east of Naran is the lake of my dreams. 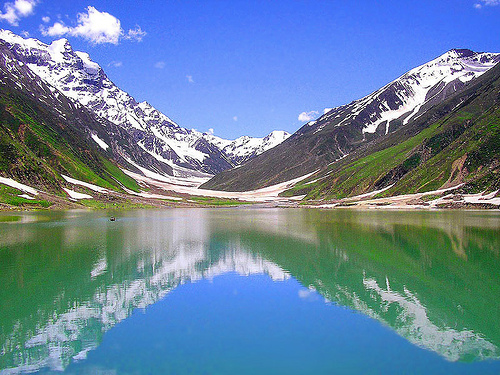 The lake and stream is named for Saiful Malook, the prince who spotted a mountain fairy bathing in the stream flowing from the lake, and stole her clothes just to tease her but then fell into love with her. 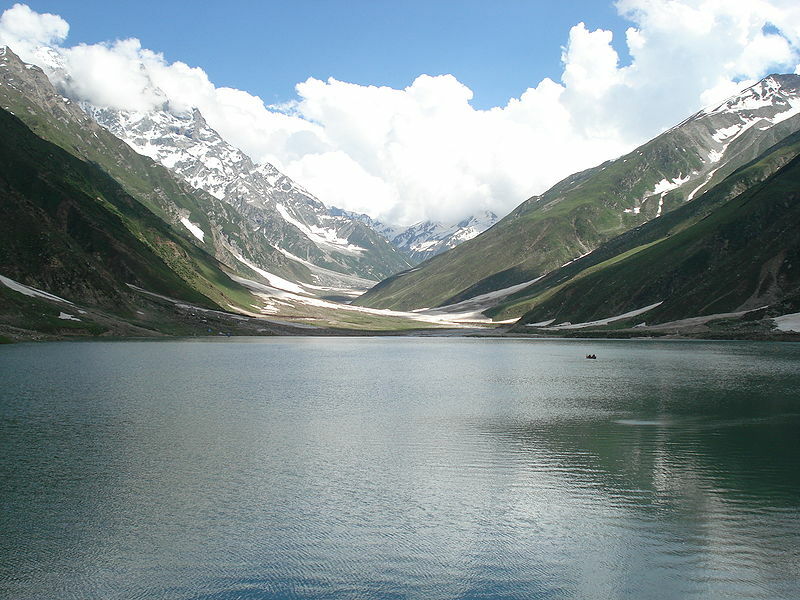 The lake is at a distance of six miles from Naran at a height of 10500 ft (3200.40 meters) above sea level. It’s easily accessible by jeep or by trekking. If you wanna trek, you need around two hours. Trekking is real fun. There is huge glacier on the way and crossing it is both adventure and fun. Saiful Malook is one of the most beautiful lakes one can imagine to exist on the surface of this earth. When I talk about the lake, words fail to describe its beauty. Anyone who has been there once can never forget the time that was spent in the company of this enchanting lake. Once I am there I never feel like leaving it; quite opposite to the Trevy Fountain in Rome, the eternal city where the visitors throw coins to wish they would come back soon. Here in the fairyland you don’t need to throw any coin. The lake itself is so charming, so luring and so tempting that I fall in love with it. But as the fairy tales are. There are demons too. The landslides, the thunderstorms and heavy rains though have a romance of their own, yet in the hilly areas they do often reverse their roles with demons of the fairy tales. So even if I don’t want to leave, these villains of the mountains force me to. It’s a pity there is no proper rest area, no hotel or a guesthouse so I must come back even though I don’t want to (neither the federally owned PTDC nor any private organization has ventured to put up a facility here where you can find a shelter from the heavy rain). There is no hotel either where you can have a rest or can enjoy the serene, cool and magical evening in the company of this most enchanting lake. So visitors beware! Take meals with you, there is no restaurant. No place to refresh and no building except the loony hut maintained by the forest department, which most of the times remains closed. So before you plan to see the fairyland, be prepared to travel like Ibn-e-Batuta. Once you have your food with you and have complete gear to travel, you will enjoy your stay, as you never did before. It’s here at my lovely Saiful that I met the queen of the mountains, the “Malka Parbat” peak which reigns over its kingdom at a majestic height of 17360 ft. Standing in the east and looking in the transparent waters of Saiful Malook I can view the majestic Malka in blue waters of the lake for the lake itself is like a mirror. It has the shape of a bowl where water from surrounding glaciers and peaks falls to form one of the loveliest wetlands in Pakistan. Boating facility at the lake is available to but can’t recommend because the lake is so deep, its depth has not been measured yet. And there is no emergency equipment or help. So dudes don’t take risk! There are a few camping sites available though which I would strongly recommend because its here that beautiful lake meets with all its charm, grandeur and its magnificence. There are small huts and shops near lake selling items you may need. Elders in the valley tell the story of a prince by the name of Saiful Malook who fell in love with a fairy. The prince was a fond lover and explorer. He would usually come to the lake in wilderness, which was surrounded by tall snow clad peaks. One day the young prince saw a fascinating spectacle. A beautiful fairy was dancing on the surface of the lake. Curiosity brought him close to her and he stole her clothes. The modest fairy agreed to marry him in return for her clothes, an incident which turned into intense love. The couple started meeting but the union enraged the fairy’s demon lover, who was so angry that out of anger flooded the entire Kaghan valley. When the floods subsided, Saiful Malook went up the lake only to find that nobody was there. After waiting all day he would come back in the evening. This went on for some days until he started to worry for the safety of the fairy. But he had no other way of finding about her whereabouts besides coming to the lake. One day he was waiting by the lake when he spotted a group of fairies having bath in the waters at the other side of the lake. He went to the other side and begged them to let him know about Badar Jamal’s (that was the name of that beautiful fairy the prince loved) whereabouts but the fairies laughed at his abysmal state. Yet a kind-hearted fairy came forward and told the prince that Badar Jamal’s movements had been confined to the close vicinity of the Koh Qaaf; a mystical range of mountains located in the Caucasus. The prince left for the Koh Qaaf, braving all odds, and finally succeeded in his mission – getting married to the fairy Badr Jamal. We at Wonders of Pakistan use copyrighted material [graphics, images etc.] the use of which may not have always been specifically authorized by the copyright owner. We make such material available to our readers under the provisions of “fair use” only. If you wish to use copyrighted material for purposes other than “fair use” you must request permission from the copyright owner. What should i say about this Heavenly place. i didn’t see this place but i can imagine there must be heavenly cool weather, ……….. hmm i wish i could go there and spend my whole life there with the one i love sooooooo much. it’s beautiful and calm but u can’t spend all your life there…1st visit it and then decide…! It is a very peaceful place. Is jagha ko dekh kar aankhon ko sakoon milta hai. Yar janay do, kon sa sakoon! sakoon ki be kayi Qismain hoti haen. Aaienay main baap ko pyar se daikho tum ko sukoon hi sukoon milega, meray bhai. AoA. When you see the creation of Allah (SWT) such as Saiful Malook & the surrounding mountains, definitely your Imaan (Faith) in Allah (SWT) is strengthehed. There are signs for those who ponder upon such creations by our Lord. May Allah (SWT) forgive us all. Aameen. Assalaam-o-Alaikum/ I love it so much.It really looks like part of heaven. i is simply awesome. fabulous, fantastic……………………………………………………………………………………………………………n the greatest gift 4m ALLAH G to us. I like saif ul malook very much. am proud of this heavenly gem that v have in Pakistan. from shahzad of islambad. but now its not very far. you can visit between March – Sep. you can contact any reliable source here in Pakistan. i visited mid july of 2012. Come on……….. Pakistanis will well come you. its a good place to see, its a real Fairyland.I love to see these places. Because from my childhood i am listening to the enchanting tale of saiful malooque. i love this place…..really love it. I think it is the most beautiful lake, a natural beauty on earth GOD ever made. According to Answer.com, the depth of Saif ul Malook is 1 km. Tam, Definately you should visit this fairyland. Whenever you may like to visit, I would be your host and guide. I have visited this magical place many times. 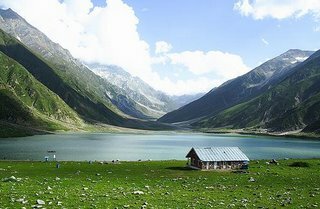 this lake is world’s most beautiful so I must want to go to this place and some similar places like this one; that carries the memory of immortal love between prince saiful malook and the fairy badar jamal. Wow, ALLAH ki qudrat ka haseen nazzara! Wow!!! I really love the views. I wish soon I can go to this lake, take a lot of photos and experience for new adventure of my life. Lets take care of our “Mother Nature”. Godspeed Pakistan! Mabuhay!!! you can visit between March – Sep. its the best you can contact any reliable source here in Pakistan. my last visit was in mid july of 2012. Whenever u want u can contact me. I have once visited lake saif-ul-malook, there is no doubt about those mysteries connected with it when u see it with your own eyes you may realize that. It was so beautiful that i always urge to visit again. I live in Calgary, Canada and about 150 kms from here are also beautiful and scenic spots like Kananaskis and Lake Louise but they’re commercialized..summer resorts and winter skiiing. But I’d love to be away from the hustle bustle and be in a place like Saif-uyl-malook. Thanks for your visit Mitha Ji. Would recommend you visit Kaghan particularly the Lake [Saiful malook] which is indeed the gem in the valley. well i have visited it a few days back, its truly a beautiful place being polluted by tourists. i boated there as well. its completely a lie that the depth of the lake hasnt been measured and the stories related to the lake are all fake! but the place is worth seeing. do go there! Hi Eman Khan, i think all guys n girls who had been there at any time also vote me that THERE IS SOMETHING. Anyone will go there and feel the truth. Its depth is unknown to till date and i m sure that there is surely some truth in the fairy tale of Saif-ul-malook. @Adil Javed, What Eman Khan says may be true though, yet the “Magic of the Lake” is so captivating, so zauberhaft that the story, especially its ambience appears as true, and that’s the ultimate beauty of Saiful. I’ve been to Pakistan twice. It’s great country!! Karel, I appreciate your visit and your good sentiments for us. I have been in the Czech Republic [though many many years ago] and found the C.R. equally fascinating, hospitable and true to the word as they say in German “gemuetlich”. Unforgettable place, I recently visited Lake Saiful Malook and I have no words to describe the beauty of this wonder of nature. Superb…….!!!!!!! Wonderful images, information about Lake Saiful Malook. I always heard about it but never seen this much information. thanks for your wonderful post. I appreciate you all for your visit and comments. Thank you. I appreciate your visit and comment. Thankyou. Fantastic article dear, I like Pakistan and its places. Such a great article. Am glad Zuhaib that you liked this post. Do visit us again [whenever you feel like] with your pertinent comments on many more articles that we have on Pakistan’s beautiful North. You will find a list of such articles under ‘Related Posts’ at the end of this reportage. The depth of saif al maluk is 50 feet. A team made a survey on all lakes of northern areas of pakistan. I asked about the depth of Saif al Maluk… According to them the depth is 50 feet. On January 31, 2010 Faisal Zia enquired about the depth of Lake Saif ul Malook and wished that the figure be authentic. Quite naturally he also wanted that source be mentioned as well. On December 3, 2010 we had the figure from Turab warraich saying according to Answers.com the depth of the lake is1 km. Yahoo Answers: Best answer chosen through votes by Yahoo Answers readers: It is unknown. There is supposedly an underground river which empties into the lake. I checked in the meanwhile the two most authentic sources namely the Encyclopedia Britannica as well as Encarta. Surprisingly there too was no mention of lake’s depth. So take your choice. However, I would appreciate if Fahad could give us further details of the team that measured the depth. Any other reader having an authentic figure in this regard or an input from the Survey of Pakistan which normally collects such data would be most welcome. Good place in Pakistan, a natural splendour, an unmatchable piece of beauty in our PAK WATAN. @Abdullah, I appreciate your visit and comment. Do visit us next time as well with your pertinent comments [if any]. Thanks for all the information, very nice post. I intend to visit the lake on Sunday July 3rd 2011. Thanks Hannan for your visit and comment. Am glad you like our post. I wish you a good journey. Am sure you will have a wonderful time there in the company of the beautiful lake Saiful Malook. Once you are back, your memories, your experience of having met the lake of love, romance and adventure, will always stay with you and that is the magic called Saiful Malook. My Name is Fahim Ahmad Janjua, am working in Ferozsons Lab.We went to the beautiful fairyland, the Saiful Malook lake on 25th Jun with Doctors Trip. It was first time that I saw this heaven on earth. No doubt its eternally beautiful place that I ever saw. I have a permanent desire now to visit this lake again and again. Really amazing. Hi i am Nain. Lake Saiful Malook truly presents a very pretty scene. 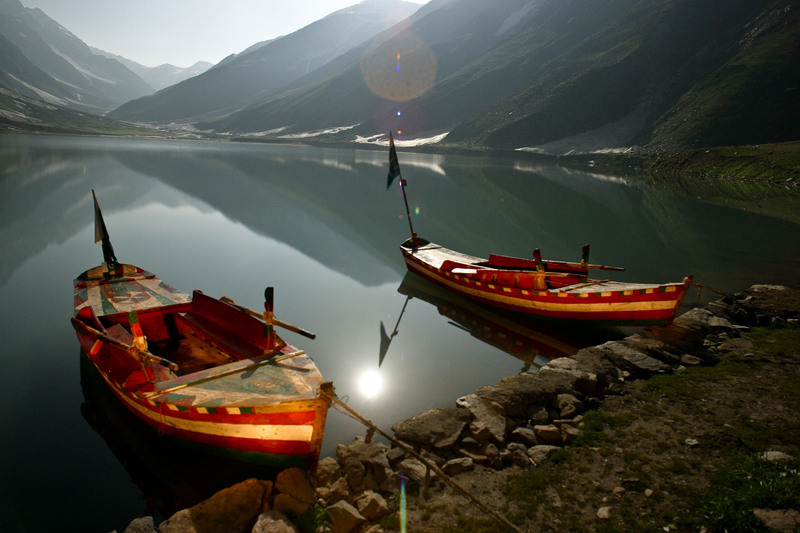 The beauty of the lake lies in the love legend, of Prince Saiful Malook and the fairy Badar Jamal. While you are there, waves of this pristine lake whisper into your ears the story of intense love the valiant prince [he travelled thousands of miles to meet his love] he had for the fairy. To this comes the locale that binds you to such an extent that you even can visualize the two loving souls in and around the lake; the fairy dancing over water and waves harping to the steps her love takes. But the words do not do justice until you yourself visit the area. If you haven’t been there as yet, do visit and you will see yourself the magic, the charm, the fun and adventure that the lake presents to every visitor who goes there to meet the Saiful Malook. can any body tell me about the depth of this lake. Usman, Plz read my comment above. I posted this on 30/5/2011. May be this is what you are asking for. I have been to Saif Ul Muluk two times in my life… It seems a heaven on the land of Pakistan.. One who visits there wants to visit again and again.. Really a worth seeing place.. I use to tell all my friends to visit the lake at least once in their life. Yes its really a wonderful place but the way is too dangerous special when its raining so its also an adventure to go there.. Walked up there from Naran. I guess the view there in winter should be awesome but in summer it wasn’t all that. Actually I enjoyed ma last trip in 2010 when we were stucked up in Naran due to heavy rain. Awesome sight people running around in fear and the main masjid were suddenly full of scared little humans. And this year it was like nothing ever happened, nobody bothered to even pray…. I did also visit another lake Lulu patsar. In doing so also saw where the river Qunar begins. Planned on going to udu pat-sar as well but unluckily some one was shot and the whole group was robbed and the locals suggested its better not to go so we returned. And then we didn’t stop. Got in the van in the morning at 9 and went to bed at 11 at night whole day walking and travelling in jeeps, was crazy but the day I would remember for life. Also you must see Ansoo lake above Saiful-Malook and I suggest you go there in Feb or Mar. To cover these beautiful mountains should be an awesome adventure to view, so my next visit probably will be to go there in winter…. Its really a wonderful place. Thank you v/much 4this extremely superb piece on an equally superb piece of wonder mother nature bestowed on Pakistan. I have seen this wonderful creation of the Almighty through your eyes. Thanks a lot for providing such valuable information to your readers. @Chauhan, I appreciate your visit and comment. Thank you. A wonderful place. And the way to lake Saif-ul-Malook is really an Adventure………………………….,,and I like it very much. I visited this lake in August, 2001. Its indeed a wonderful place. But most wonderful thing is that where from does the cold water come, particularly when it is descending from a height of 10,500/- ft. above the sea level and a reasonable quantity of water comes out from the lake every time yet the level of the lake remains same. The water is so cold, clean and has a shine, one can’t imagine. Regarding the depth of the lake: I would say that common sense dictates that at an elevation of about 3 km above sea level you are not going to get a lake that is 1km or 1.7km deep. It would be a marvel of nature, also considering the geography surrounding it, it seems impossible. I think as someone else pointed out the depth of 50 feet sounds about right. I believe this is among the most significant info for me. And I am satisfied studying your article. But you should remark on few normal issues, The site taste is perfect, the articles is really excellent : D. Excellent process, Cheers! I love my country and our Pak Army. I visited the lake. It’s a very beautiful place indeed. When we saw it, our souls were completely refreshed & rejuvenated. A lovely place no doubt. Is it real or just a story??????? Afrasayab, Its the story of Saiful Malook’s real presence in the Vale of Kaghan and it is the [real] depiction of the love legend between Prince Saiful Malook and the Fairy Badar Jamal. Have you considered including some social bookmarking links to these sites. At least for youtube. Saiful Malook is really a very beautiful place, on our planet earth …. Masha Allah! Last year I spent 5 days there. I can’t 4get those days at least in my life. I also can’t wish to go there again, because I only want to live with the fond memories of those wonderfully sweet days of my life. The lake of Prince Saif-ul-Malook and the fairy Badar-e-Jamal is a nice, fascinating place. n we reallly enjoyed a lot……………….. This place is awesome….when i went there i enjoyed a lot. I hear so many news about this Lake. I don’t know whether it’s true or not? But there is some truth coz, there is shine all over the lake every Fourteen of Moon Night. There is some strange type of creature dance on this Lake. An intriguing discussionthat is definitely worth commenting. I do think that you need to publish more about this topic, it may not be a taboo but usually people do not discuss such subjects. To the next on this topic! Kind regards!! It is a heavenly place. I had been to many such areas during my Army service, but never been to the places like these. I wish to visit & see these places, I love nature, Asif Ali Agha. I’m gone to tell my little brother, that he should also pay a visit this weblog on regular basis to obtain updates from newest news. i just visited it on Eid this time and it’s true i never imagine a place like this on earth ever in my life. that’s really a ALLAH’S gift to our Pakistan. Thank you for yet another informative website. Where else could I be getting that kind of info written in such an ideal approach? I’m leaving for Naran today…Since my childhood days, I’ve been waiting to see this amazing lake…And there is a mystery bout Saif-ul- Malook that has been fascinating me ever since. So wish to see all what is there. Will share my views once I’m back. Wish you a happy journey. Would welcome your experience, your thoughts and your over all opinion about the fairyland called Saif-ul- Malook. It’s actually very complicated in this active life to listen news on Television, therefore I simply use world wide web for that purpose, and take the most up-to-date news. It’s amazing to visit this site and reading the views of all mates concerning this article, while I am also zealous of getting experience. I’m gone to tell my little brother, that he should also visit this blog on regular basis to obtain updates on latest news about such beautiful places in Pakistan. I want 2 go there. This place is gorgeous. Very nyc lake. I love Pakistan nd Pakistan Army ……………….. 😛 😛 😛 …………… plxxxx pray for Pakistan. We support Pakistan, Pakistan zindabad……. 😉 😉 😉 …………. I love Pakistan. We also love Pakistan ……. 😛 😛 😛 yup !!!!!!!!!!!! My lil sister N i also want 2b there. Baba is planning 2 go there. Pakistan zindabad ………………. I also support Pakistan nd our Army …… 😉 😉 😉 ….. wow! Such a gorgeous place, this lake. ohhhhhhhhh really nyc 😛 😛 😛 tafreeh kren ge yaroooooo. Attractive element of content. I just stumbled upon your blog and in accession capital to claim that I get in fact loved account your blog posts. Any way I’ll be subscribing to your augment and even I achievement you get admission to constantly fast. I too am an aspiring blog blogger but I’m still new to everything. Do you have any recommendations for first-time blog writers? I’d really appreciate it. much deeper way than we actually realize. You’re so interesting! I don’t think I’ve read a single thing like that before. So good to discover someone with a few original thoughts on this subject matter. Seriously.. thank you for starting this up. This site is one thing that is required on the web, someone with a bit of originality! Now the time has come to enjoy my present, an smokeless cigaret from Health e Cigarette, a gift coming from my brother to quit smoking. Cheers! Tha tiny lake Saful-Malook (From photos) reminds me of mountain lake Kausar Nag in Kashmir India.In mid summer huge snow chunks of glacier float in this beautiful lake. Hey there! I’ve been reading your site for a long time now and finally got the bravery to go ahead and give you a shout out from Kingwood Tx! Just wanted to tell you keep up the great job! Hello, I am so happy I found your blog page, I really found you by accident, while I was searching on Askjeeve for something else. Regardless of what I was looking for, I am here now and would just like to say many thanks for an incredible post and an all round thrilling blog (I also love the blog theme/design). I don’t have time to go through it all at the moment, but have bookmarked it and also included your RSS feeds, so when I have time I will be back to read a great deal more, Please do keep up the superb job. Hello friends, fastidious piece of writing and nice, urging comments. I am genuinely impressed and enjoying all the matter on this page. When some one searches for a material of his/her interest, so he/she has it all on this site available in detail, which is regularly updated and immaculately mintained over here. Well there is no doubt that the lake is one of the most beautiful places on earth. I will Insha’ Allah go there to see the magnificent beauty of Saif-ul-Malook. Otherwise too, Pakistan is a beautiful gift of Allah SWT. We should work together to bring prosperity to our motherland. Nowadays Pakistan is passing through critical situation. May Allah help us to become one nation under one flag. A nation of Pakistanis and Pakistanis alone, and there should be no concept of Punjabi, Sindhi, Balochi, Pathan and Kashmiri in our country. We are Muslim and we should be united as one nation of 180 million Pakistanis. I wouldn’t mind composing a post or elaborating on a few of the subjects you write with regards to here. Again, awesome website! needed to ask. Does operating a well-established website such as yours take a large amount of work? can I use this post on my website? I’ve got some creative ideas for your blog you might be interested in hearing. Either way, great site and I look forward to seeing it improve over time. What is the Exact Depth of this Lake? @Anas Muneeb, The matter regarding the depth of Lake Saiful Malook already came under discussion at the WoP forum here. Had you cared to read the comments, you would’ve gotten some idea about the depth of the lake. Anyway I’m putting up once again my earlier observation that I already posted. found it really useful. it has helped me a lot. appeared to be on the internet the easiest thing to keep in mind of. Woah! I’m really digging the template/theme of this website. It’s simple, yet effective. A lot of times it’s challenging to get that “perfect balance” between user friendliness and visual appearance. I must say you’ve done a great job with this. In addition, the blog loads super fast for me on Internet explorer. Excellent Blog! What’s up, after reading this amazing paragraph i am as well happy to share my knowledge here with mates. @Raza-ur-Rehman, The best time to visit the lake is from 15 June to 15 Oct. But beware! Landslides and small/big glaciers slipping downhill are common in the area. Therefore, before you proceed, do collect some info on the condition of the road, landslide, glaciers etc. stuff, well done! ? ! saiful malook is fantastically good looking, wonderful place. Using a tripod is strongly recommended whenever shooting out in the wild. So we do have to care about, what is on the new block. Many food photographers use strobes for lighting, but I never have. I’m sending it to some friends ans additionally sharing in delicious. And obviously, thank you for your effort! Helloo Guys, We are introducing the one and only hotel at this magnificent and lake Saif-ul-Malook. Now you can ejoy the the breathtaking scenery during the day and the moonlite magical nights next to bonfire at night. Please contact 0321 981 0202 for details. p.s. paved road to the lake is expected to open this season. So now you could drive your car to Saif-ul-Malook. You’re so awesome! I don’t believe I’ve read anything like that before. So wonderful to discover somebody with genuine thoughts on this subject. Seriously.. many thanks for starting this up. This website is something that’s needed on the internet, someone with a little originality! Layers of lightweight clothing are preferred to reduce your weight load and keep you warm and dry. lake saif-ul-malook is shrinking day by day and the climate there is getting hotter due to climate change and the green house effect. something has to be done about it. I’ve got some ideas for your blog you might be interested in hearing. Either way, great blog and I look forward to seeing it expand over time. I wonder how a lot attempt you set to make this sort of wonderful informative web site. Thanks for finally writing about >Lake Saif-ul-Malook | Wonders of Pakistan <Liked it! It’s remarkable to pay a visit this web site and reading the views of all colleagues on the topic of this piece of writing, while I am also keen of getting familiarity. Rally nice, hope you will write more on Pakistan tourism sites. data, is there any other website which offers such information in quality? Optez pour une séance de voyance gratuite sur notre site web de tarologie et d’augure. vie, parce que ce celui qui a connaissance de son avenir saura mieux profiter des opportunités souvent négilgés. professionnelle, et ils répondent avec plaisir à toutes vos questions. en privé avec une voyante pendant 10 minutes. Hello to every , for the reason that I am truly keen of reading this webpage’s post to be updated daily. you lose weight without dieting. will be effective. Could someone have been planted these handkerchiefs to prove he was dead. an access to updated information on residential property for sale. Can climate change whatever the source, affect behavior. Another great tip on how to stop a panic attack on a plane is by being prepared. He was looking down on the ground and the brightness temporarily blinded him. using a cold pack or cool compress on the nerve infected area. shingles, due to which their weight is more, and durability is better. AoA. Beautiful place indeed.Would it be safe for a Westerner to visit? Well it’s totally fine for the western to visit the valley there are no issues at all , I was there a week ago its amazing place. forwarded to you, whether or not they are from your buddies. thoughts before writing. I have had a tough time clearing my mind in getting my thoughts out. It is a wonder place in the world . I just love to vist this place. now this is what i called heaven. these are in my bucket list. Lake Saif-ul-Malook such a lovely place i would like to visit it.